Procrastinators who’ve left their holiday shopping until the last minute needn’t worry that they’ve run out of time to find gifts people will actually want. For those frazzled folks, T&V offers a last-minute gift guide, highlighting a few local shops and holiday market booths with goods sure to please even the pickiest family members. A cheese monger at Beecher’s told T&V said that the company’s cheese curds are a unique and frequent gift because the squeaky snack is not always easy to find. The shop also sells pre-made gift sets offering a hat box full of cheese and crackers for $55. A couple of options are available with different varieties of cheeses, with one offering the shop’s popular fig spread. For the lactose intolerant, the shop also has a handful of quirky sauces and spreads, including the fig jam, a rosemary and pear spread and caramel mustard. For the most adventurous lactose tolerant, the shop offers a chevre cheesemaking kit for $27. While some may have gotten holiday shopping out of the way with Black Friday, Small Business Saturday and Cyber Monday, Town & Village has put together a guide for those who are looking to shop local for their gifts and offer some ideas for more unconventional presents. Many neighborhood restaurants offer gift cards that provide more of an experience rather than a tangible present. First Avenue’s Petite Abeille offers gift certificates for $15 and $20 that can be combined. SPiN, the Susan Sarandon-owned bar on East 23rd Street, offers gift cards with any amount that can be used for food or drink, as well as for games of ping pong. Nearby wine shops include Cork and the newly-opened Rouge and Blanc, both on First Avenue. Both shops also have an extensive collection of wines from various regions as well as spirits. Rouge and Blanc manager Dean Barak said that the shop will be having promotions on champagne, cava and prosecco in the weeks leading up to the New Year. The store, which offers free delivery, also offers a 10 percent discount for all Stuyvesant Town and Peter Cooper Village residents who show their ID. For all other customers, the wines are 10 percent off of four bottles, 15 percent off of eight bottles and 21 percent off of 12 bottles. Jill Pratzon, a Stuyvesant Town resident and art restorer, also has a business that would not typically provide conventional holiday gifts, but she does have options for those who want to give the loved one a gift of renewing a damaged or aging painting. She said that while even smaller jobs take about a month to complete, meaning that a painting would not be ready for gifting before Christmas, she could provide free consultations and treatment proposals for art owners who can bring their paintings into her studio at 122 West 26th Street. Other local businesses that offer experiences rather than new consumer goods are some of the yoga studios in the neighborhood. Kim Stetz, owner of Savasana Station on Avenue B, is having a December Special with “12 Days of Yoga,” offering gift certificates with 12 classes for $60. The certificate activates with the first class attended and it expires a year after purchase. They can be purchased at savasanastation.com/gift-certificates. Reflections Center for Conscious Living and Yoga at 227 East 24th Street offers flexible gift cards that can be purchased with a specific amount that can be applied as credit or to be used for specific classes or class packages. The studio offers various yoga classes to pick from, as well as stretching classes and meditation. Gift givers looking for something to wrap up for theater-lovers can get gift certificates to a couple of different neighborhood institutions. 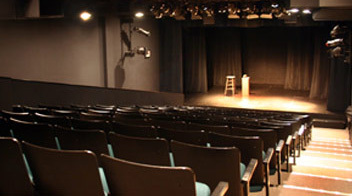 The Irish Repertory Theatre, which is currently holding performances at the Daryl Roth 2 at 103 East 15th Street while its West 22nd Street location is renovated, offers gift certificates that are good for two tickets for any show. Because the holiday shows are popular, the certificates can’t be used to reserve tickets to a specific show at the time it is purchased, but can be used to purchase tickets for later shows, depending on availability. Gift certificates can be bought by going to irishrep.org and going to the tickets section. Memberships for the theater can also be gifted but those looking to gift a membership may want to call the theater to ask about it specifically rather than buying a gift certificate on the website. Another nearby theater company with a slightly different focus is the Peoples Improv Theater, which offers classes and various improv shows. Gift certificates are available in any amount and can be purchased for a specific class or just as credit that can be used for any class. They don’t have gift certificates available that can be used for tickets to see shows but they have a handful of holiday-themed shows throughout the month, including “The PIT Factor New Years Eve Edition” on December 30, “Dean Martin Christmas Pitacular” on December 20 and “This is Why You’re Single” on December 9, 16 and 23. 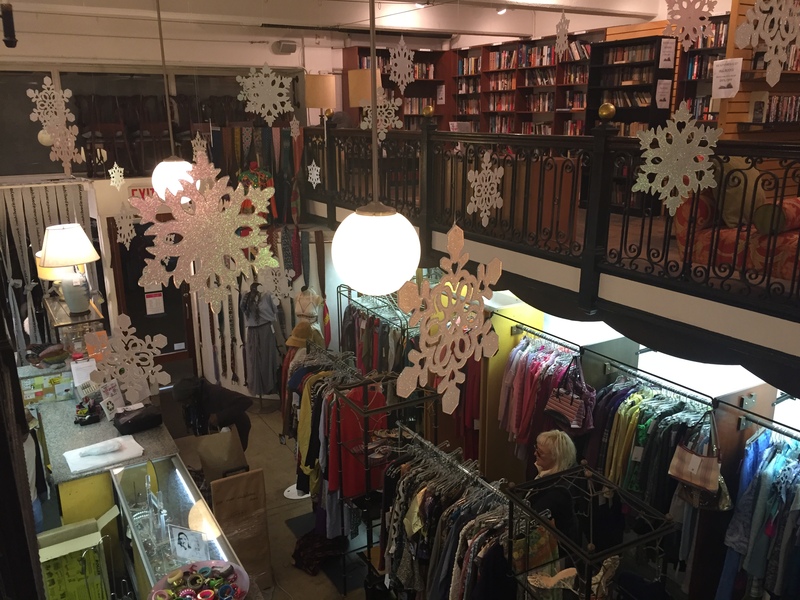 For lovers of vintage and second-hand clothing, not to mention shoppers who love a bargain, East 23rd Street’s thrift shop row can be a goldmine of affordable gifts. Non-profit animal organization Cauz for Pawz is gearing up for the holidays with sales throughout the store every day this month. Owner Cathryn Duhigg said that the sales will vary from 10 to 20 percent off on different items, varying the sales every day. For example, winter coats were 30 percent off on Tuesday and gloves/hat sets might be on sale in the future. Some of the weekend sales at the store will focus on the non-clothing items, with various stands featuring home goods and various accessories, including headphones, perfume sets and smartphone cases. The store’s basement also has complete dining sets and a rack towards the back of the store with featured holiday accessories, which Duhigg noticed was already disheveled from shoppers picking through for holiday bargains. The nearby City Opera Thrift Store has antique furniture, as well as cheap books, glasses, plates, vases and other housewares. Manager Diego Medina said that some of their more popular items are the artwork and international items like textiles. As for their clothing, the store is having a “Black and White” event next Wednesday, December 10 from 3 to 7 p.m. where black and white clothing items will be featured for those looking for something to wear to this season’s holiday parties. 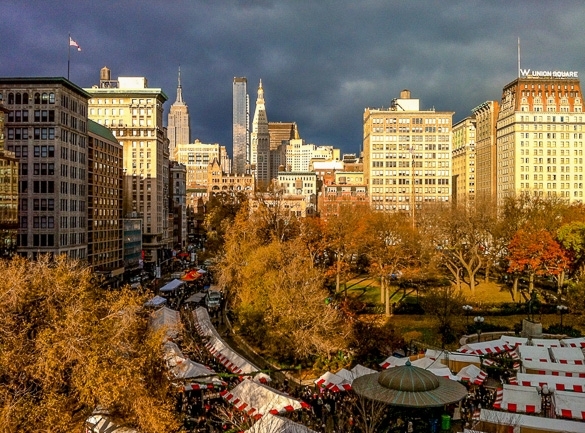 For small businesses looking to boost foot traffic during holiday season, there is arguably no better location than a holiday market, specifically, the 150-plus booth one that takes place at Union Square Park each year. The market has grown over the 19 years it’s been run there by the company Urban Space, occupying the south end of the park, and a stroll through on any day it’s open clearly shows there’s always a steady stream of shoppers. 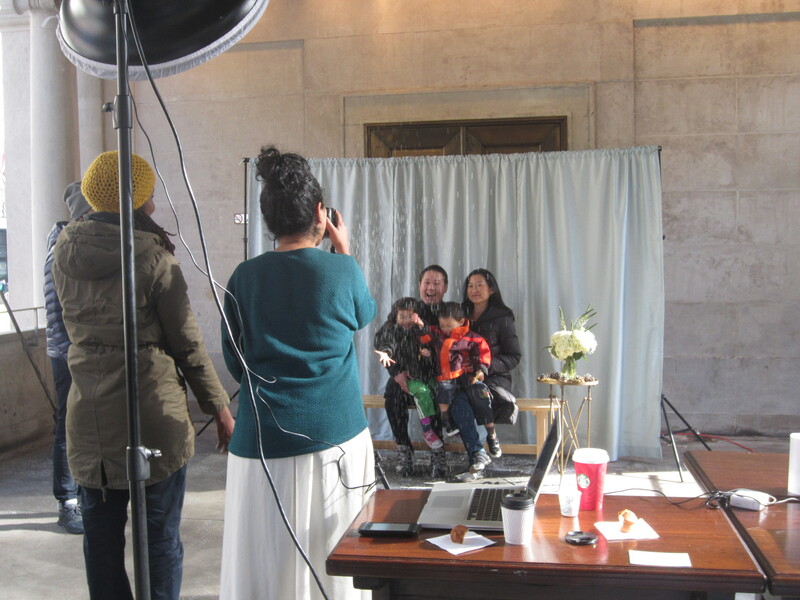 Urban Space has kept a tight lid on what it charges vendors for use of its red and white striped booths, but on a recent day, an operator of a medium-sized booth said his rent was about $15,000. This is for the five weeks, November 21 to Christmas Eve, that the event runs. Not that he was complaining. “It’s the busiest hub in the city,” he said. He, like the majority of merchants there, are repeat tenants, and those thinking of becoming one might want to sign up soon. A rep for Urban Space, Rachel Van Dolsen, said that the “footprint” of the event has gotten as big as it’s going to get. 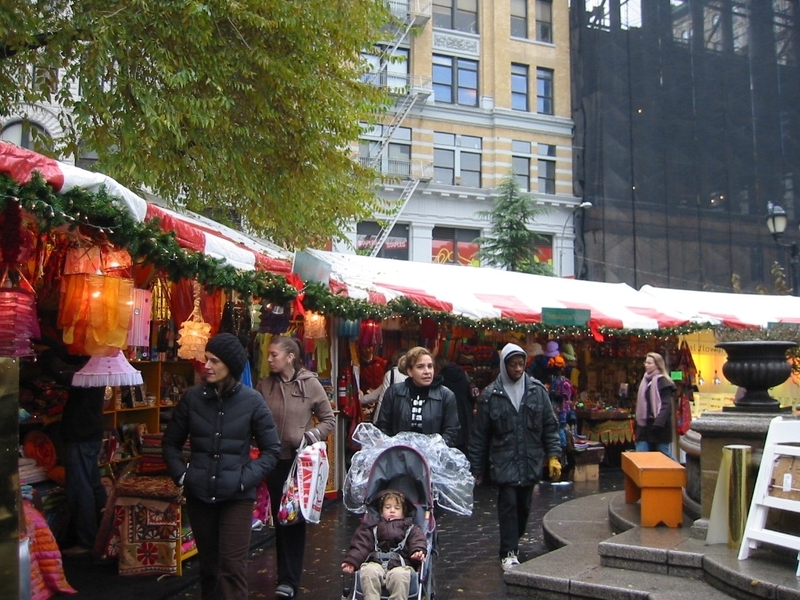 Along with its location on top of an entrance to the Union Square subway, the market has become a hit with shoppers looking for items that are handmade or hard to find as opposed to mass-produced items, which Urban Space doesn’t allow. Last year the amount of money the company shelled out to the city in exchange for use of the park was $1,378,972, so even without official numbers, it’s clear the bustling bazaar must do pretty well for the organizer. The city of course makes out too, with its cut going to a general fund. Of course, being that the event runs throughout one of the year’s coldest months, even with the built-in foot traffic, there are still going to be retailers who don’t want to conduct business outdoors as well as businesses that wouldn’t be able to sell effectively in one of the stalls. As Faith Hope Consolo, a broker for the real estate firm Douglas Elliman, explained it, “The holiday market is for a very specific customer, and if that retailer sells products for that shopper, sure, it makes sense to go there. These can include holiday decorations, ornaments, one-of-a-kind gifts. But a pop-up probably makes more sense for apparel. You might want to try on something, and an outdoor market is not the place for that.” Electronics are also not a big seller at markets, noted Consolo, though accessories are. At this time, asking rents for retail spaces around Union Square are around $60 per square foot to $90 per square foot on the side streets, while asking rents on the avenues are a whopping $400 per square foot. The rent gets higher closer to Flatiron, added Consolo. And of course, these are the prices for longterm leases, not pop-up shop spaces, which around holiday time, are hard to come by. In related neighborhood retail news, to help push shopping at neighborhood stores as the market is open, the Union Square Partnership has been offering District Deals booklets at the information booth at the market (across from the subway entrance gazebo). 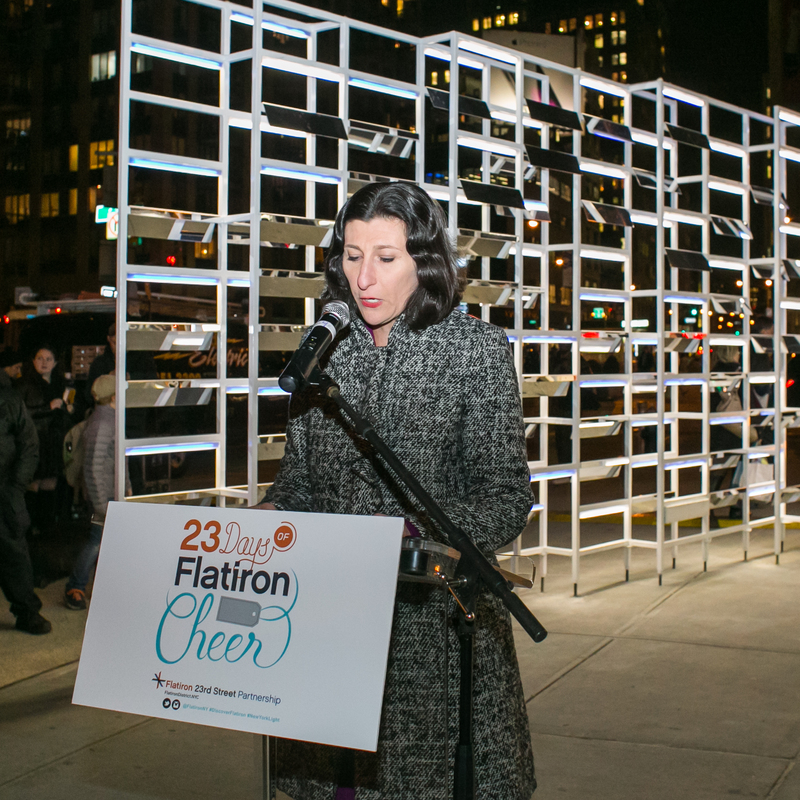 The booklets contain over 40 deals from retailers like Union Square Wines and Spirits and Jivamukti’s yoga school.